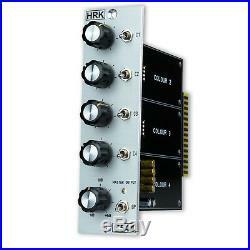 Quantity: 1 - Preamp Only - no additional colour module. 4 Colour Slots per Channel. 1:1 Ratio Gain/Trim Colour Drive Circuit. +20dB Colour Drive Gain Range. Bypass Switch for Each Colour Module. +/-6dB Output Trim Gain Range. Master Bypass Switch and LED Indicator. Studio Grade Texas Instruments Opamps. Compatible with DIYRE Colour Format. The C544 is a Mono Colour Processor with four Colour Module Slots. Each Colour Module stage has Drive/Trim circuit with 1:1 Ratio. The dual potentiometer controls the Drive Gain before the Colour Module and the Attenuation of the output signal from the Colour Module. As a result, the Colour module Drive Intensitivity increases while the output level remains the same. Each Colour Module stage has the Bypass Switch which allows the easy A/B operation. The C544 has the +/-6dB Master Output Trim and the Master Bypass with the LED indicator. The Master Bypass is located after the Master Output Trim. We send world wide from European Union. Brand New, Assembled, Tested and Ready to Use. 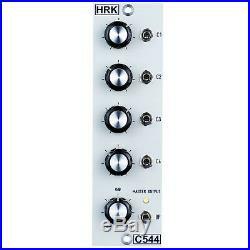 The item "C544 Mono Colour Processor 4 Slots DIY Recording Equipment CP5 DIYRE Palette" is in sale since Monday, June 4, 2018. This item is in the category "Musical Instruments\Pro Audio Equipment\Preamps". The seller is "bartlomiejh2007" and is located in Lodz.